Want burritos but no rolling? This recipe is really fast and easy. In the picture I used 8 inch (ish) whole wheat flour tortillas and stacked it higher then normal, but you can do it with three larger tortillas if you wish. Place 1 tortilla on a cookie sheet and pre-heat your oven to 350F. Saute your onion, red pepper, and ground beef (or turkey) together until the meat is cooked and the veggies are soft and yummy. Sprinkle in the cumin and chili powder, stirring. Take it off the heat. Stir in enough salsa to make it saucy but not dripping-I use about 1/2 jar, so maybe 1/2 cup? Stir in the mashed up kidney beans and the chopped coriander. Spread 1/3 of the mixture over the tortilla sitting on the cookie sheet. Sprinkle with some cheese, top with another tortilla. Top with 1/3 more filling, more cheese, repeat layers, ending with the last tortilla. Sprinkle with cheese. 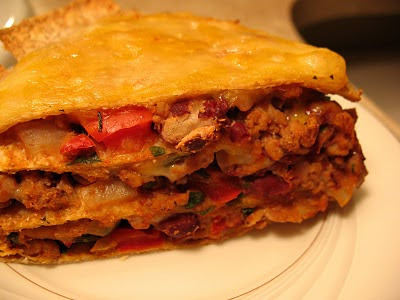 If you have a lot of filling, you can add another layer of meat and cheese, topping with another tortilla. Bake in the 350 F oven for about 15-20 minutes until the cheese is melted and everything is warm and bubbly. We just slice it up like a pie and eat it, but you could serve it topped with chopped lettuce, black olives, sour cream, etc.